Today Supt. Jody P. Weis announced the results from a first-of-its-kind joint operation targeting criminal activity in several Chicago neighborhoods. The operation consisted of Chicago Police personnel and teams from the Bureau of Alcohol, Tobacco and Firearms; Federal Bureau of Investigation; US Marshals Service; Illinois Department of Corrections; Illinois State Police; Cook County Sheriffs Office; and Cook County State's Attorneys Office. The successes include: 32 felony arrests; 71 misdemeanor arrests; 24 parolees returned to prison for violating terms of their parole; 18 arrest warrants executed; 16 search warrants executed; 17 vehicles impounded; 3 stolen vehicles recovered; 70 moving violations; 72 parking violations; 8 guns seized, including a .50 caliber Desert Eagle; nearly $20,000 in narcotics and $4,000 in cash seized. 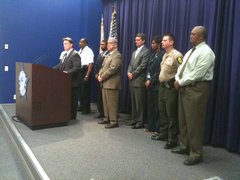 Pictured in the photo are, from left to right, Chicago Police Superintendent Jody P. Weis; Deputy Superintendent Ernest Brown; Darryl McPherson, US Marshals Service; Michael McCotter, Illinois Department of Corrections; Tom Trautmann, Federal Bureau of Investigation; Dana Nichols, Bureau of Alcohol, Tobacco and Firearms; Colonel Mark Maton, Illinois State Police; and Chief Dewayne Holbrook, Cook County Sheriffs Police.